Can you get the table re-surfaced? or a good power sanding and finish in wax? Picked this up free. Never sat outside, but water was allowed to stand on the table and the rust is a year old. Not sure if it is pitted. Can the three table parts be machined? After being impressed with what a lot of you guys have done to old tools here, I am encouraged to go whole hog on this thing. 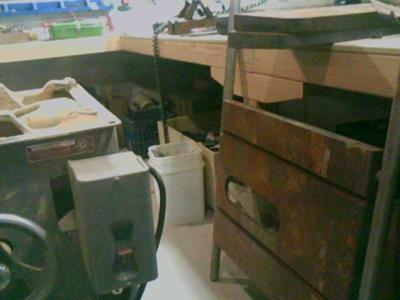 I am in the process of building a shop with much of my Dad's tools (DL 40 lathe, 12" Delta band saw, Rockwell drill press, 6" metal lathe, thousands of fasteners,sundries, etc., a load of hand tools, antique planes, various hardwoods (quarter sawn pine, white oak, walnut, purple heart, Hunduran mahogany (one piece is 5/4x37"x10'), bl walnut, buttternut, bass, beech, birch, red maple, flame mahogany, rosewood, babinga,cocobolo, etc, etc.). My brother got his 1988 Unisaw and I got his older 1950's Craftsman contractor table saw. But I lucked out when a friend let me know a buddy was dumping this old timer. Is it worth replacing the arbor bearing (feels tight but not terribly smooth)? Should I replace the brushes (still an inch left to them)? Is it difficult to replace the motor leads(crumbling insulation)? Worm gears look in good shape , just need cleaning. Just a good cleaning and paint the exterior and sand the tables or do you guys disassemble the whole thing? Can I have the tables resurfaced - ground - or will they become uneven and miter guides be proud? How do you resurface the miter guides without creating slack? Sand blast and random orbital/wet sand 80/100 grit? Short of re-grinding, is it worth filling any pits? With what? Liquid steel? If you are interested I have the motor cover and saw blade guard assembly for this saw. You can e mail me @ jkresner@cfl.rr.com or call me @ 407 484 5005.